Give a mother the gift of style with this heart warming diamond and gemstone ring. The 10k white band matches any style and gleams with a bright shine. The gold is beautifully crafted to spell out "Mom" to let her know she's special. The center holds a blue topaz stone that measures 5mm by 5mm and displays a gorgeous azure color. This blue topaz is heart shaped for an endearing design. A diamond accent adds an attractive sparkle to this very special ring. 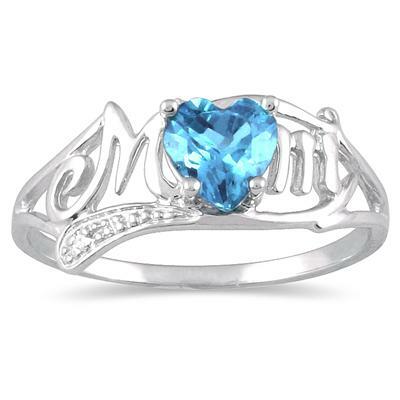 We guarantee our Blue Topaz and Diamond Heart Shaped MOM Ring to be high quality, authentic jewelry, as described above.